When their lives fall apart, famous African-Americans (Malcolm X, Kenny Gamble, Tawana Brawley, Benjamin Chavis, John Allen Muhammad, Henry Tillman, Mike Tyson, James Ujaama) have a pattern of converting to Islam; there's also a lesser pattern of other blacks (Marion Barry, Alcee Hastings, Gus Savage, George Stallings) accepting help from the Nation of Islam. (For details on both, see my 2006 article, "King of Pop Michael Jackson and Black Converts to Islam.") This weblog entry pursues the topic of Westerners of any ethnicity converting to Islam when stressed or otherwise going through a time of trouble. Lindsay Lohan: The perpetually-troubled actress carried a Koran as she left her stint doing court-ordered community service at a children's center in Brooklyn. (May 13, 2015) May 14, 2015 update: A spokesperson for Lohan responded to questions raised by the Koran appearance: "To my knowledge she is not considering fully converting to Islam, but I know she has been taking a keen interest in the Arabic culture of late." She has forthcoming projects in the Middle East and is eager to learn the Arabic language. "She also spent some time in Dubai earlier this year and became interested in their way of life." Lindsay Lohan carrying a Koran. Oct. 19, 2016 update: Lohan responded to the backlash against the picture of her carrying a Koran: "They crucified me for it in America," she said. "They made me seem like Satan. I was a bad person for holding that Quran. I was so happy to leave [America] and go back to London after that, because I felt so unsafe in my own country. 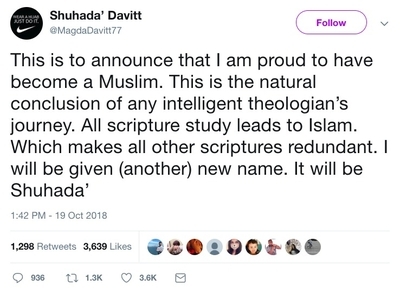 If this [Islam] is something that I want to learn, this is my own will." Jan. 16, 2017 update: New evidence suggests more forcefully that Lindsay Lohan has indeed converted to Islam, but still she has not come out and said so. Feb. 8, 2017 update: Lohan tells about carrying a Koran, reading in it, and fasting for three days during Ramadan. Apr. 5, 2017 update: More evidence about Lohan's conversion, this time pictorial, from Phuket, Thailand. 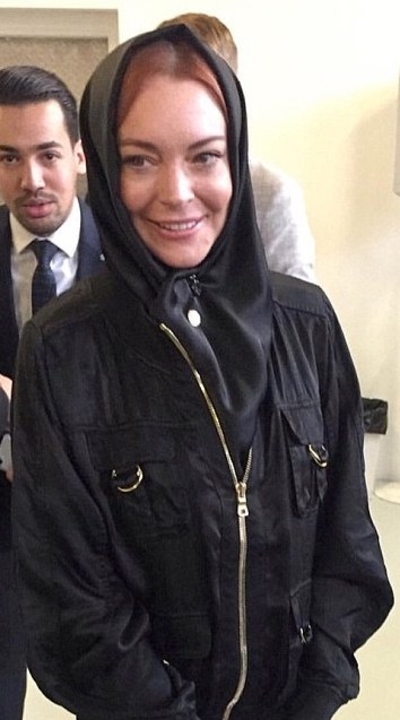 Feb. 18, 2018 update: Lohan made an appearance in hijab at the London Modest Fashion Week. Lindsay Lohan at the London Modest Fashion Week. The next five years would witness multiple contracts, several near death experiences, and an extreme drug overdose. 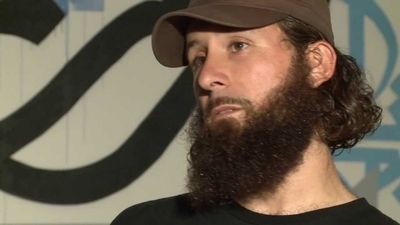 In 1996, Jordan converted to Islam and paused his Skateboarding career to focus on spiritual growth and disrupting the cycles of addiction and sabotage that he had grown accustomed from being placed in such high profile spaces at such a young age. After ten years, he returned to the professional skating scene. Sinead O'Connor, the Irish singer, has announced in a tweet that she's left Christianity and converted to Islam. This follows on intense mental-health issues. Here, for example, are some details from an August 2017 article titled "Sinead O'Connor Says She's Suicidal, Living in New Jersey Motel." O'Connor has been very vocal about her mental health issues in the past. She canceled her 2015 Summer tour due to "exhaustion due to an existing not resolved medical situation." After failing to return home from a bike ride in May 2016, she was reported missing, only to be found in a hotel by Chicago suburban police. She also publicly cut ties with her family in November 2015 after she shared news that she had suffered an overdose in a Dublin hotel room. 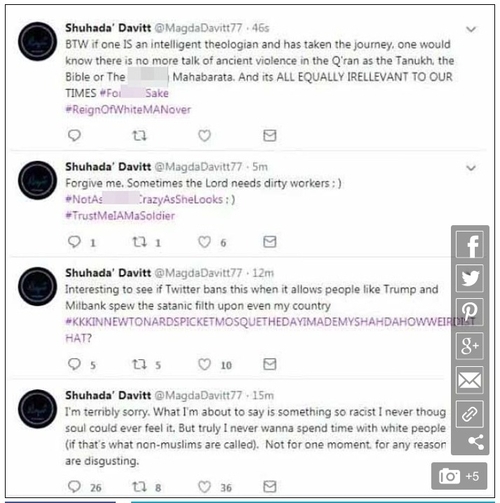 Nov. 6, 2018 update: Pursuing her own variant of Islam, the very white O'Connor tweeted that she "never wanna spend time with white people again," along with other noteworthy sentiments.